We carefully match hounds to homes and on ‘Gotcha Day’ send them off with everything they need for a great start to their forever life. A ‘Forever Ready’ gift donation will help us pay for tags, collars and leads as well as any medical treatment or behavioural support they’ve needed to prepare them for their forever home.You will receive a gift card explaining how your gift donation will help the dogs in our care. 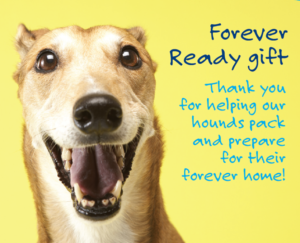 ‘Forever Ready’ gift donations will fund Forever Hounds Trust’s kennelling costs and support all dogs in the charity’s care.